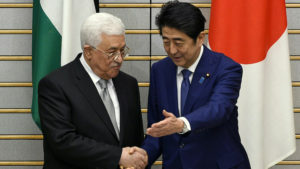 Japan is on the verge of recognizing the Palestinian State as the Asian country also looks to mark up its contribution to the UN Relief agency in Palestinian territories (UNRWA) after the US cut its assistance in a move to force Palestinians embrace Washington’s alleged peace plan. The recognition could take place soon, Nabil Shaath, international relations adviser to Palestinian Authority President Mahmoud Abbas told the media recently. The Palestinian official told the Palestinian news agency Wafa that Japanese Foreign Minister Taro Kono is working to get the signatures from Japanese lawmakers to demand the recognition of Palestine. Kyoto is also planning to give more weight to the Palestinian diplomatic mission in Japan, from delegation to a representative office, Shaath also emphasized. “Japan supports the formation of a new international framework for managing the peace process, breaking free from US monopoly over it,” Shaath said. The future recognition will constitute a major international endorsement coming from a global power amid growing pressure from Washington and some Arab countries on Palestinians to relinquish eastern Jerusalem to Israel. President Donald Trump in December declared the old city capital of Israel despite UN resolutions requesting that the fate of the city be determined at the final status negotiations by both Palestinians and Israelis. Mahmoud Abbas said at a recent meeting with British Foreign Minister Boris Johnson that Palestinians are keen to engage in peace talks with Israel but under the auspices of an international forum and with US role reduced. The PA has insisted that the US has disqualified itself as neutral peace broker and called Trump’s December decision Israel-biased. Part of its contribution to UNRWA, Japan will fund water projects in the Gaza Strip, including $1.6 million for the construction of a water treatment plant in Gaza to be used in agriculture projects. It also donated $1.1 million for the reconstruction of Rafah stadium in southern Gaza, which was destroyed in the war with Israel. Japan is backing the two-state solution. Posted by KanelkaTagba on Feb 7 2018. Filed under Headlines, World News. You can follow any responses to this entry through the RSS 2.0. Both comments and pings are currently closed.